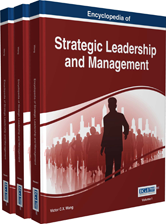 The Encyclopedia of Strategic Leadership and Management investigates emergent administrative techniques and business practices being utilized within corporate and educational settings. Chapter 40 (Re) Defining Leadership in Higher Education in the U.S.
Chapter 48 What Motivates an Individual to Lead and Engage in Leadership Development? Chapter 122 The Conundrums of Strategic Leadership: Leading of Organizations, in Organizations, or through Organizations?